The American Classic is a simpler design copied from the thirties and forties style swings that graced most American porches. The swing has a slight contour on the front edge with a slight lumbar support on the back. 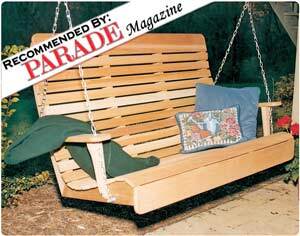 Still a very popular swing that is priced to fit most budgets while maintaining the highest quality craftsmanship. Made from 100% Western Red Cedar. Western Red Cedar does not absorb water or lose water as fast as other woods making it the ideal material for outdoor furniture - it does not warp, crack, bow, or check as much as other woods. Cedar also contains oils that are a natural insect repellant. Cedar resists decay, disease and rotting. Comes with Zinc Plated Hardware, and has a maximum capacity of 900 lbs (700 lbs with springs). Seat Dim: 19"H x 18"D, Seat Length: 4'(45"). Our Fanback Series with its elegantly arched back speaks of leisure; just inviting you to lean back and relax. 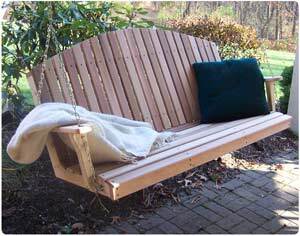 This hand-crafted swing with its modern design is a favorite on the west coast and mountain areas. Very comfortable, sturdy and looks great. Made from 100% Western Red Cedar. Western Red Cedar does not absorb water or lose water as fast as other woods making it the ideal material for outdoor furniture - it does not warp, crack, bow, or check as much as other woods. Cedar also contains oils that are a natural insect repellant. Cedar resists decay, disease and rotting. Comes with Zinc Plated Hardware, and has a maximum capacity of 900 lbs (700 lbs with springs). Seat Dim: 25.5"H x 18"D, Seat Length: 4'(45"). The Highback Sweetheart Series comes with our award winning design. The design features include a lower lumbar support, deep seating area and the a high head rest. The Highback Sweetheart Series is also available in the Highback Design. A very sturdy and durable choice. Made from 100% Western Red Cedar. Western Red Cedar does not absorb water or lose water as fast as other woods making it the ideal material for outdoor furniture - it does not warp, crack, bow, or check as much as other woods. Cedar also contains oils that are a natural insect repellant. Cedar resists decay, disease and rotting. Comes with Zinc Plated Hardware, and has a maximum capacity of 900 lbs (700 lbs with springs). Seat Dim: 29"H x 18.5"D, Seat Length: 4'(45"), Weight: 4'(45lb.). The Highback Series comes with our award winning design. The design features include a lower lumbar support, deep seating area and a high head rest. A very sturdy and durable choice. The Royal Highback Swing is recommended by chiropractors for it's award winning lumbar support. Made from 100% Western Red Cedar. Western Red Cedar does not absorb water or lose water as fast as other woods making it the ideal material for outdoor furniture - it does not warp, crack, bow, or check as much as other woods. Cedar also contains oils that are a natural insect repellant. Cedar resists decay, disease and rotting. Comes with Zinc Plated Hardware, and has a maximum capacity of 900 lbs (700 lbs with springs). Seat Dim: 29"H x 18.5"D, Seat Length: 4'(45"), Weight: 4'(45lb.). The Sweetheart Swings are constructed with a slight lumbar support for your lower back and the deep seating provides for great comfort. The sweetheart is accompanied with 2 small heart designs on the top and is set off with a scroll design on each side. A porch or patio favorite! Made from 100% Western Red Cedar. Western Red Cedar does not absorb water or lose water as fast as other woods making it the ideal material for outdoor furniture - it does not warp, crack, bow, or check as much as other woods. Cedar also contains oils that are a natural insect repellant. Cedar resists decay, disease and rotting. Comes with Zinc Plated Hardware, and has a maximum capacity of 900 lbs (700 lbs with springs). Seat Dim: 20"H x 18"D, Seat Length: 4'(45"). The American Classic is a simpler design copied from the thirties and forties style swings that graced most American porches. The swing has a slight contour on the front edge with a slight lumbar support on the back. Still a very popular swing that is priced to fit most budgets while maintaining the highest quality craftsmanship. Made from 100% Western Red Cedar. Western Red Cedar does not absorb water or lose water as fast as other woods making it the ideal material for outdoor furniture - it does not warp, crack, bow, or check as much as other woods. Cedar also contains oils that are a natural insect repellant. Cedar resists decay, disease and rotting. Comes with Zinc Plated Hardware, and has a maximum capacity of 900 lbs (700 lbs with springs). Seat Dim: 19"H x 18"D, Seat Length: 5'(55"). Our Fanback Series with its elegantly arched back speaks of leisure; just inviting you to lean back and relax. 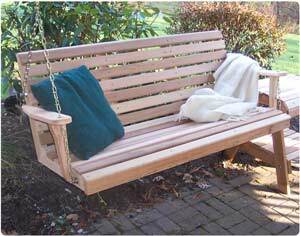 This hand-crafted swing with its modern design is a favorite on the west coast and mountain areas. Very comfortable, sturdy and looks great. Made from 100% Western Red Cedar. Western Red Cedar does not absorb water or lose water as fast as other woods making it the ideal material for outdoor furniture - it does not warp, crack, bow, or check as much as other woods. Cedar also contains oils that are a natural insect repellant. Cedar resists decay, disease and rotting. Comes with Zinc Plated Hardware, and has a maximum capacity of 900 lbs (700 lbs with springs). Seat Dim: 25.5"H x 18"D, Seat Length: 5'(55"). The Highback Sweetheart Series comes with our award winning design. The design features include a lower lumbar support, deep seating area and the a high head rest. The Highback Sweetheart Series is also available in the Highback Design. A very sturdy and durable choice. Made from 100% Western Red Cedar. Western Red Cedar does not absorb water or lose water as fast as other woods making it the ideal material for outdoor furniture - it does not warp, crack, bow, or check as much as other woods. Cedar also contains oils that are a natural insect repellant. Cedar resists decay, disease and rotting. Comes with Zinc Plated Hardware, and has a maximum capacity of 900 lbs (700 lbs with springs). Seat Dim: 29"H x 18.5"D, Seat Length: 5'(50"), Weight: 5'(50lb.). The Highback Series comes with our award winning design. The design features include a lower lumbar support, deep seating area and a high head rest. A very sturdy and durable choice. The Royal Highback Swing is recommended by chiropractors for it's award winning lumbar support. Made from 100% Western Red Cedar. Western Red Cedar does not absorb water or lose water as fast as other woods making it the ideal material for outdoor furniture - it does not warp, crack, bow, or check as much as other woods. Cedar also contains oils that are a natural insect repellant. Cedar resists decay, disease and rotting. Comes with Zinc Plated Hardware, and has a maximum capacity of 900 lbs (700 lbs with springs). Seat Dim: 29"H x 18.5"D, Seat Length: 5'(55"), Weight: 5'(50lb.). The Sweetheart Swings are constructed with a slight lumbar support for your lower back and the deep seating provides for great comfort. The sweetheart is accompanied with 2 small heart designs on the top and is set off with a scroll design on each side. A porch or patio favorite! Made from 100% Western Red Cedar. Western Red Cedar does not absorb water or lose water as fast as other woods making it the ideal material for outdoor furniture - it does not warp, crack, bow, or check as much as other woods. Cedar also contains oils that are a natural insect repellant. Cedar resists decay, disease and rotting. Comes with Zinc Plated Hardware, and has a maximum capacity of 900 lbs (700 lbs with springs). Seat Dim: 20"H x 18"D, Seat Length: 5'(55"), Weight: 5'(45lb.). The American Classic is a simpler design copied from the thirties and forties style swings that graced most American porches. The swing has a slight contour on the front edge with a slight lumbar support on the back. Still a very popular swing that is priced to fit most budgets while maintaining the highest quality craftsmanship. Made from 100% Western Red Cedar. Western Red Cedar does not absorb water or lose water as fast as other woods making it the ideal material for outdoor furniture - it does not warp, crack, bow, or check as much as other woods. Cedar also contains oils that are a natural insect repellant. Cedar resists decay, disease and rotting. Comes with Zinc Plated Hardware, and has a maximum capacity of 900 lbs (700 lbs with springs). Seat Dim: 19"H x 18"D, Seat Length: 6'(69"). Our Fanback Series with its elegantly arched back speaks of leisure; just inviting you to lean back and relax. 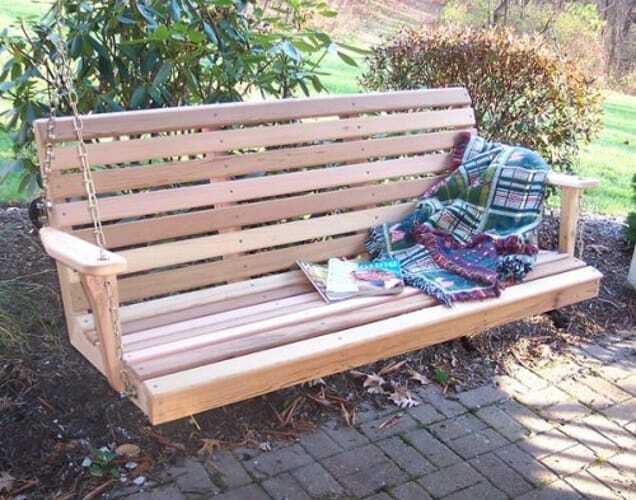 This hand-crafted swing with its modern design is a favorite on the west coast and mountain areas. Very comfortable, sturdy and looks great. Made from 100% Western Red Cedar. Western Red Cedar does not absorb water or lose water as fast as other woods making it the ideal material for outdoor furniture - it does not warp, crack, bow, or check as much as other woods. Cedar also contains oils that are a natural insect repellant. Cedar resists decay, disease and rotting. Comes with Zinc Plated Hardware, and has a maximum capacity of 900 lbs (700 lbs with springs). Seat Dim: 25.5"H x 18"D, Seat Length: 6'(69"). The Highback Sweetheart Series comes with our award winning design. The design features include a lower lumbar support, deep seating area and the a high head rest. The Highback Sweetheart Series is also available in the Highback Design. A very sturdy and durable choice. Made from 100% Western Red Cedar. Western Red Cedar does not absorb water or lose water as fast as other woods making it the ideal material for outdoor furniture - it does not warp, crack, bow, or check as much as other woods. Cedar also contains oils that are a natural insect repellant. Cedar resists decay, disease and rotting. Comes with Zinc Plated Hardware, and has a maximum capacity of 900 lbs (700 lbs with springs). Seat Dim: 29"H x 18.5"D, Seat Length: 6'(69"), Weight: 6'(54lb.). The Highback Series comes with our award winning design. The design features include a lower lumbar support, deep seating area and a high head rest. A very sturdy and durable choice. The Royal Highback Swing is recommended by chiropractors for it's award winning lumbar support. Made from 100% Western Red Cedar. Western Red Cedar does not absorb water or lose water as fast as other woods making it the ideal material for outdoor furniture - it does not warp, crack, bow, or check as much as other woods. Cedar also contains oils that are a natural insect repellant. Cedar resists decay, disease and rotting. Comes with Zinc Plated Hardware, and has a maximum capacity of 900 lbs (700 lbs with springs). Seat Dim: 29"H x 18.5"D, Seat Length: 6'(69"), Weight: 6'(54lb.). The Sweetheart Swings are constructed with a slight lumbar support for your lower back and the deep seating provides for great comfort. The sweetheart is accompanied with 2 small heart designs on the top and is set off with a scroll design on each side. A porch or patio favorite! Made from 100% Western Red Cedar. Western Red Cedar does not absorb water or lose water as fast as other woods making it the ideal material for outdoor furniture - it does not warp, crack, bow, or check as much as other woods. Cedar also contains oils that are a natural insect repellant. Cedar resists decay, disease and rotting. Comes with Zinc Plated Hardware, and has a maximum capacity of 900 lbs (700 lbs with springs). Seat Dim: 20"H x 18"D, Seat Length:6'(69"). 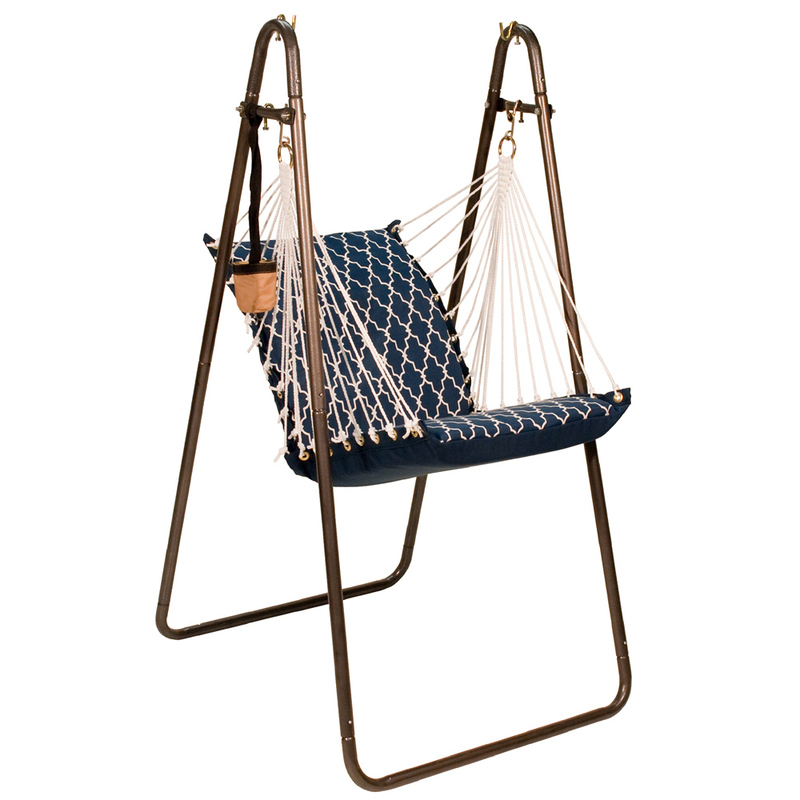 This Algoma chair frame fits rope and fabric hanging chairs. Contemporary style and sturdy design make it a perfect complement to the hanging chair. Beautiful speckled powder-coated finish complements your porch or patio. Made of 100% steel with bronze powder coated finish. Extra strong, heavy gauge tubing throughout stand construction. Accommodates models 1500, 4987, 6817, 8987. A longtime customer favorite, for good reason! 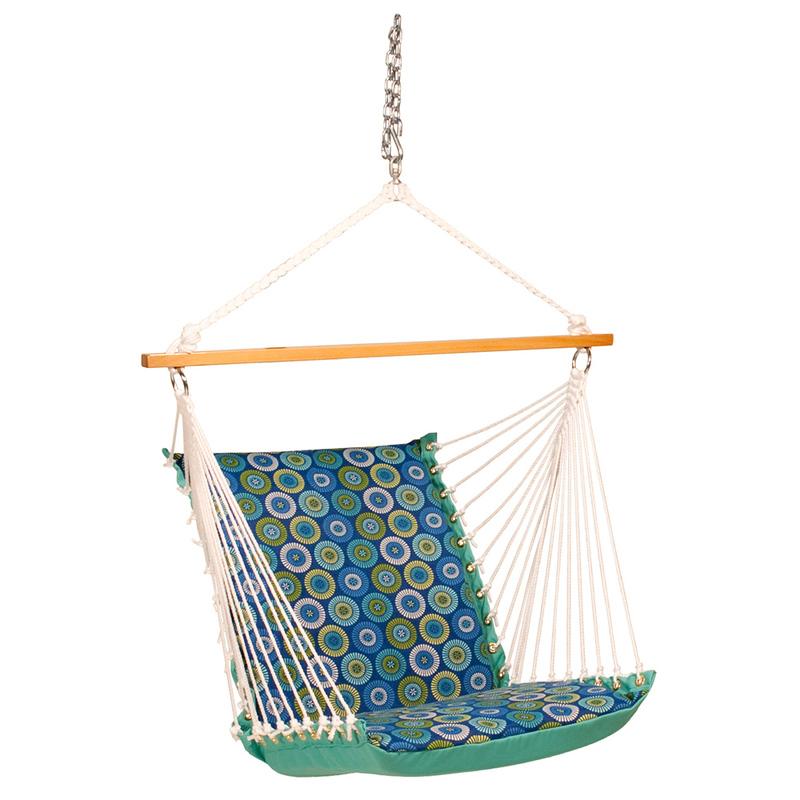 Our cushioned single swings capture a whole lot of relaxation potential in not much space. The back and seat cushions are both an ample 2-feet square, though that isn't what gives these airborne chairs their compelling sense of spaciousness. We use DuraCord for the fabric as well, because it handles weather like a charm, resistant to staining, rot, mold and mildew, yet all the while is as soft as cotton. Not to mention that it's amazingly colorfast. 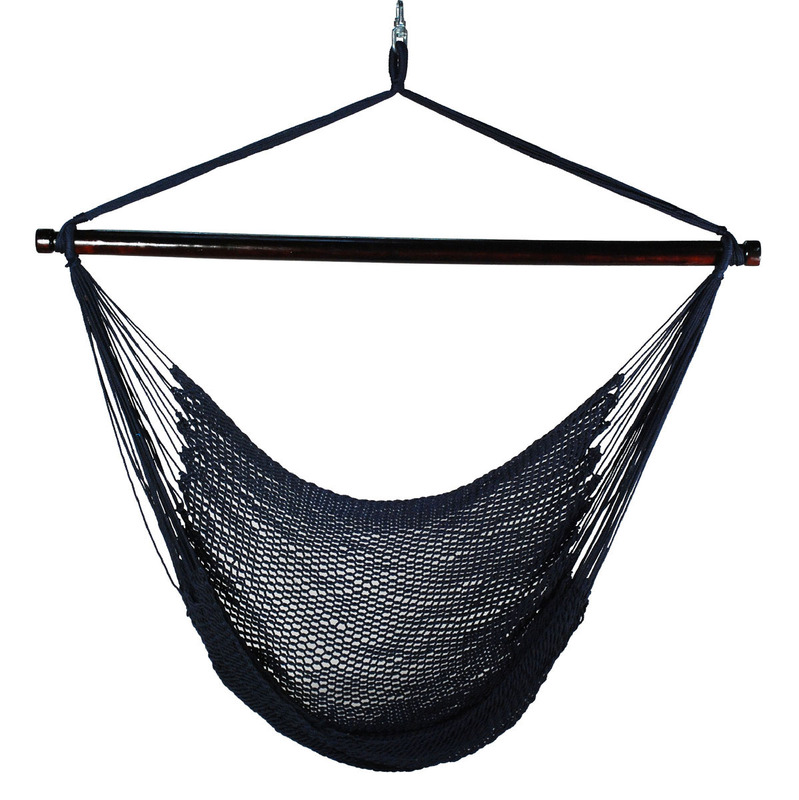 The Hatteras Hammocks Double Cushion Swings are two ample sheets of compellingly desgned all-weather fabric sandwiching fluffy layers of pillowy polyester fiberfill batting and Cumaru arms and frame for a sturdy, yet very attractive addition to your yard. 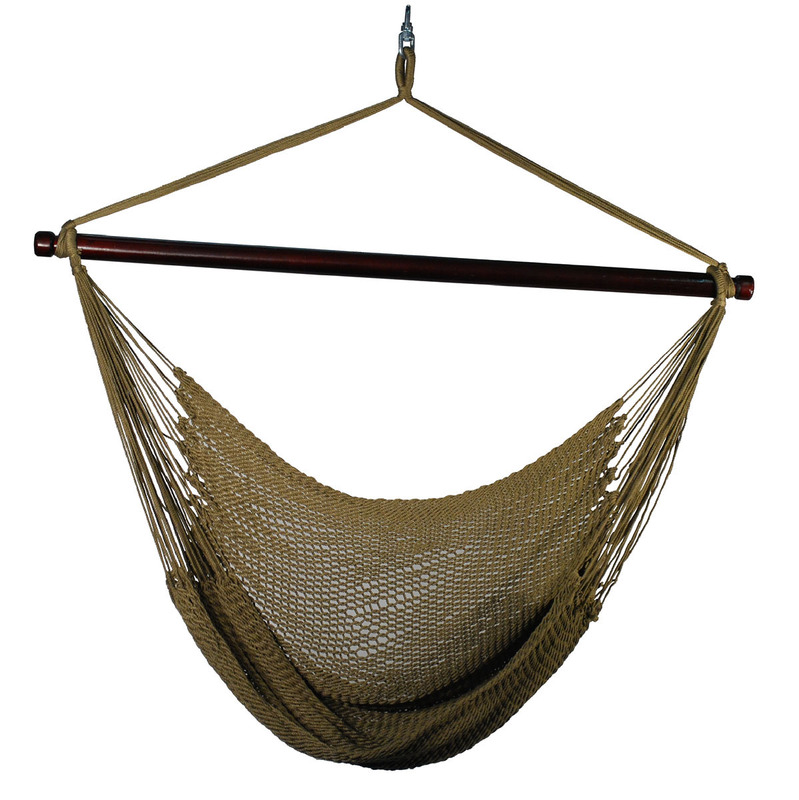 The Hatteras Hammocks Double Cushion Swings are two ample sheets of compellingly designed all-weather fabric sandwiching fluffy layers of pillowy polyester fiberfill batting and Hard Oak arms and frame for a sturdy, yet very attractive addition to your yard. Includes the stand, 2 accent pillows (Not shown) and the Deluxe Cushion Swing. Some assembly required. 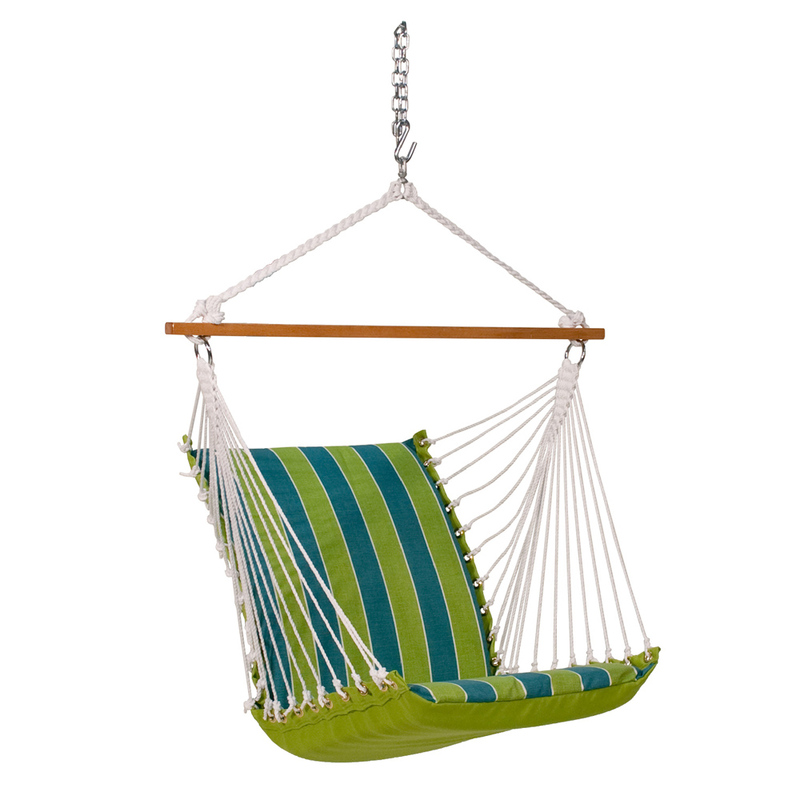 Enjoy all that summer has to offer from this comfortable cushioned hanging chair. 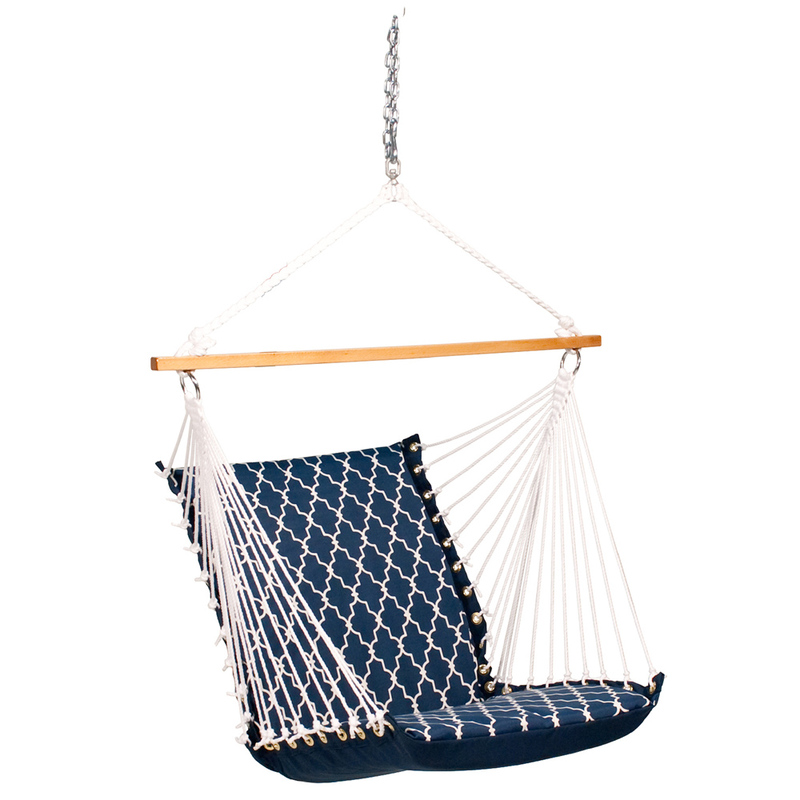 Made from spun polyester fabric, it features a hardwood spreader bar, comfortable thick foam seat and back, chain with s-hook, and mildew-resistant polyester rope cord. Can be hung from ceiling beam, patio, or Algoma c-style hanging frame. Made in the USA. Hanging from porch, tree, or Algoma's C-frame model 4750BR. 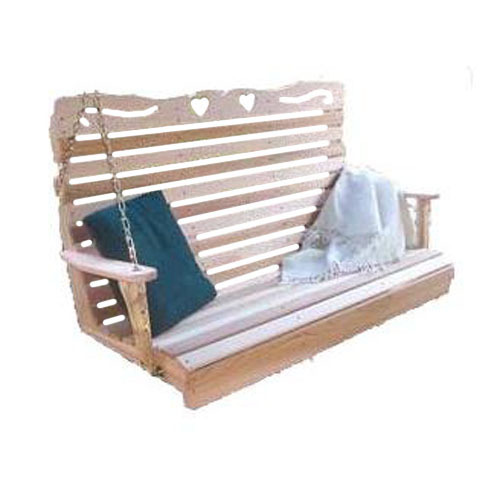 With its big, bountiful cushions, handsome construction and cottony-soft fabric with stripes of seafoam blue, tobacco brown, oatmeal and loden green like some peaceful ocean sojourn, this superb piece of backyard abandon will have you and your favorite relaxation companion swinging unabashedly straight into bliss. Includes the Metal Double Swing Stand. Enjoy the perfect place to sit and read, or just relax. This oversized hammock chair allows you to stretch out or curl up. The wide 44" spreader bar holds the chair open to the perfect distance, for easy entrance and exit. The tightly woven soft polyester rope resists the effects of sun and rain, yet is soft and comfortable. Enjoy the perfect place to sit and read, or just relax. 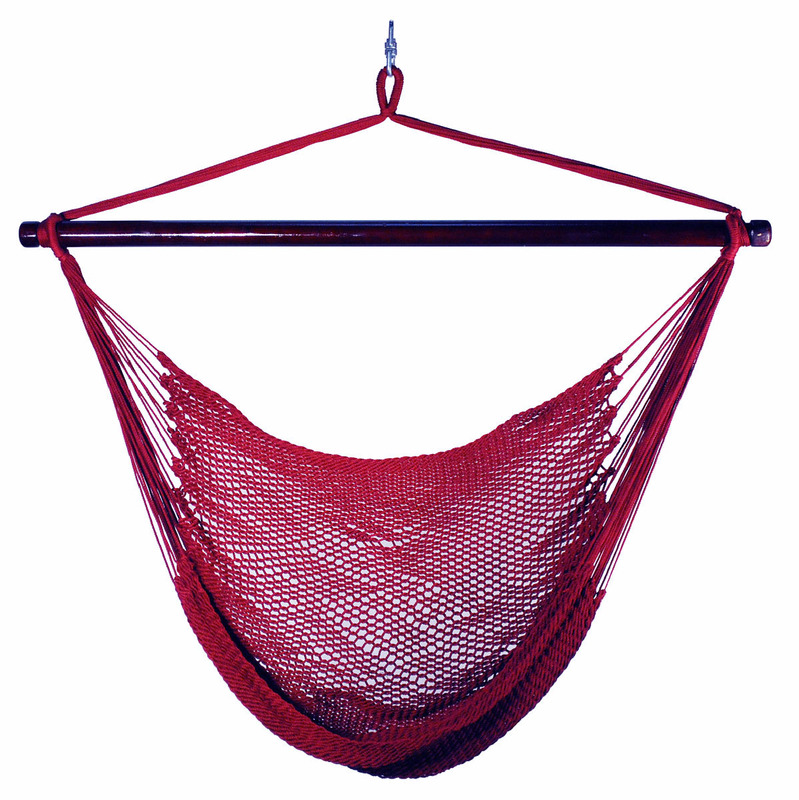 This oversized hammock chair allows you to stretch out or curl up. The wide 44" spreader bar holds the chair open to the perfect distance, for easy entrance and exit. The tightly woven soft polyester rope resists the effects of sun and rain, yet is soft and comfortable. .
44" hardwood spreader bar creates a comfortable 30" to 40" wide seat. 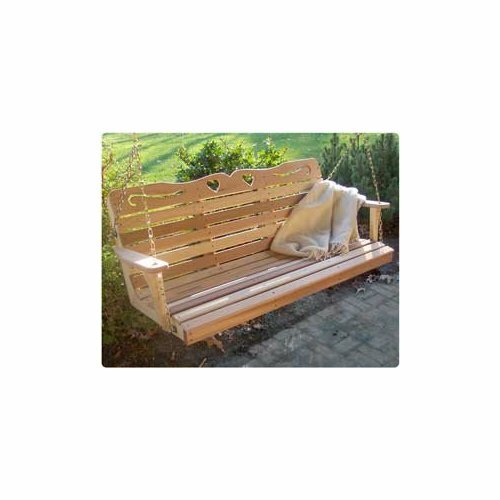 Can be hung from trees, porches, patios, indoors or on model #4750BR stand. This hanging chair with stand is so comfortable and relaxing. Chair is made of spun polyester fabric with thick cushions and 100% polyester rope macramé clew ends. 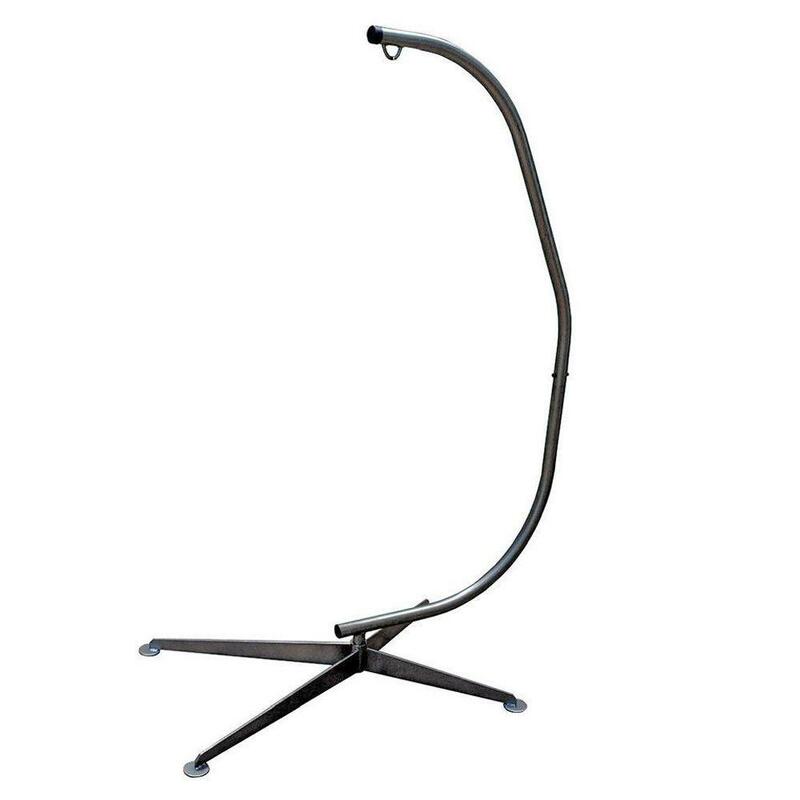 Steel stand has powder coated finish and easy lock-pin construction; very easy to setup and enjoy. Made in the USA.